One of the most anticipated movies of the summer is here. Although anticipated may not be the correct word to use since the new all female Ghostbusters has received some of the most viral hatred on the internet that any movie has received in a while. But it is here for better or worse and the results are surprisingly good. This film may not exceed expectations but it will certainly deliver exactly what audiences should expect from the director and actors of Bridesmaids, The Heat and Spy. This film shoots for the middle and hits a bullseye. It plays it safe so everybody walks out happy. I do wish that the film started out with the old school Columbia pictures logo, which the original Ghostbusters from 1984 made iconic for me every time I think about it from countless times watching the VHS tape as a child. The opening shot is of an old mansion in New York City and the script jumps right into the exposition with some quick jokes that you may miss if you are not paying attention (the Anti-Irish fence). The characters are female carbon copies of ones created in the first film. Kristen Wiig is Bill Murray, reluctant, sarcastic and cares more about social norms as well as being open with her flirtations. Melissa McCarthy is Dan Aykroyd’s overzealous and enthusiastic scientist who gets excited over anything paranormal. Kate McKinnon is Harold Ramis’ Egon, the brainy inventor and the Harpo Marx of the group with all gadgets and gizmos, there is never a scene where she does not have at least one crazy prop on her body, the same as Egon in the the original. Finally, we have Leslie Jones as the sassy streetwise member of the team replacing Ernie Hudson’s Winston Zedmore (Zedmore=Zeppo Marx). The original Ghostbusters was always just a modern update on the Marx Bros. classic comedy formula, Bill Murray as Groucho trying to get the girl, Dan Aykroyd as the fast talking Chico and Sigourney Weaver as the poor Margaret Dumont character that everything bad seemed to happen to. The performances in the remake are all very good. Wiig and McCarthy have already proven themselves as movie stars and this is another good notch on their resumes. A big kudos to current Saturday Night Live cast members Kate McKinnon and Leslie Jones. In this movie they prove that they are indeed ready for prime time and can handle being in a big budget movie. Also special commendation should go to Chris Hemsworth playing very well into the dumb blonde stereotype, instead of being a beautiful female, they made him a hunky beefcake alpha male and his scenes work seamlessly, never feeling forced. Plus Charles Dance, Ed Begley Jr. and Andy Garcia all are welcome presences in their supporting roles. The one disclaimer is the inherent racism. Despite Leslie Jones’ acting being quite fine, it is very sad that in 2016 they had to make the lone black ghostbuster the one without a science background. There are plenty of African-American science geeks out there working in a lab right now as I type this and I think that would have been acceptable and rather refreshing to see that image of an African-American rather than the street savvy stereotype and the three white ones as scientists and inventors. The plot delivers exactly what you would expect however the screenplay is filled with clever dialogue and some great jokes that make it stand out from the usual run-of-the-mill summer blockbusters. Like the first Ghostbusters, and every Marx Bros. movie, this film takes shots at the upper class stuffed shirts of academia. It is a film about working class people trying to start a business, pay the bills and by mere coincidence save New York City from a disaster of Biblical proportions. The script is funny, the acting is great. There are a ton of references to the original film, even the cameos by stars from the original are so cleverly done that this Ghostbusters could work on two levels as a fresh reboot or as a belated sequel to the earlier films from the 1980’s. Some of the humor is intelligent and clever, but there are some funny sophomoric gags involving fart and poop jokes, the good news is they all work. The final act, especially the end fight, contains way too much CGI and not enough of the humor the rest of the film had. But it did contain some great sets. The architectural look of many pieces recalled sets from the previous film along with costumes, one-liners and even the foods they ate. The design of New York City towards the end of the film when the ghosts arrive and start to take over are very nostalgic and will make viewers think of the New York City from previous eras. Everything in this movie is adequate enough, the whole thing just felt unnecessary. Bottom line, the all female Ghostbusters is a good movie, but not a great one. Honestly, I think that everyone will like this movie. It is smart and funny enough to please, or at least appease all the people in the seats. However I doubt that many people will love this movie. Stay for the end credits, there are more jokes, cameos and even a hint at the sequel fans of the original film will enjoy should this movie make enough money to warrant one. 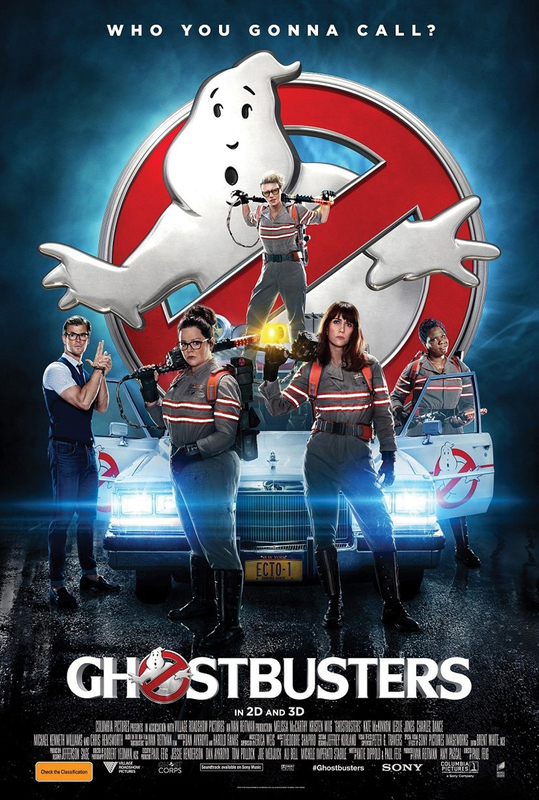 Even though the 1984 Ghostbusters is a comedy classic and a sacred film for so many people, this new one will not offend its most ardent fans (such as myself). They will not find anything blasphemous here. This Ghostbusters will not make the late Harold Ramis roll over in his grave, just make him scratch his head and chuckle a few times, and that is not bad at all. Great review! Looking forward to seeing the new Ghostbusters movie soon!